Growing up, I was never a huge fan of deviled eggs. Even though I liked eggs prepared other ways, I would avoid deviled eggs like the plague. No joke. If I saw a plate of those creamy little eggs at a family party, I would do everything I could do avoid them! As an adult, I have come to realize the reason I didn’t like many things as a kid is because it wan’t prepared well or in a way that I enjoyed. I have come to love many things as an adult that I didn’t enjoy as a child. Deviled eggs are one of those things. The first time I decided that I liked them is when we prepared them using my mother-in-law’s recipe. My husband has always enjoyed them and I never understood why until that day. From there, I have experimented with different ways to make them – some turned out well, others not so well. 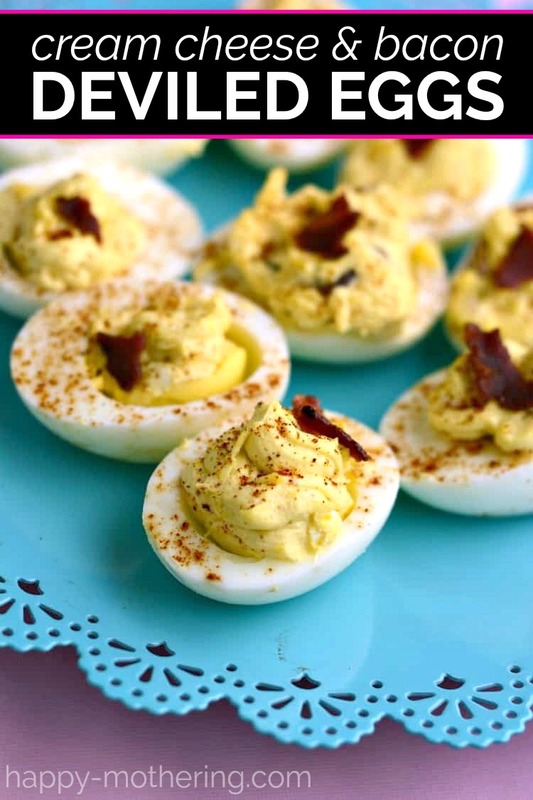 Today, I’m bringing you a recipe for Cream Cheese and Bacon Deviled Eggs. Bacon makes everything better, doesn’t it? That’s true with deviled eggs too. I hope you’ll try this twist on the original recipe (perhaps this Easter!) and let me know what you and your family think! Are you tired of the same old deviled eggs recipe? This Cream Cheese and Bacon Deviled Egg recipe is a delicious spin on the original. Slice your hard boiled eggs in half length wise and then remove the yolk. Place the yolk in your blender with cream cheese, mayonnaise and mustard, and mix until it's creamy. Stir in chopped cooked bacon (don't blend the bacon - you want the texture). Place the mixture into a plastic bag with a cut corner or pastry bag and fill each egg white with the deviled egg mixture. 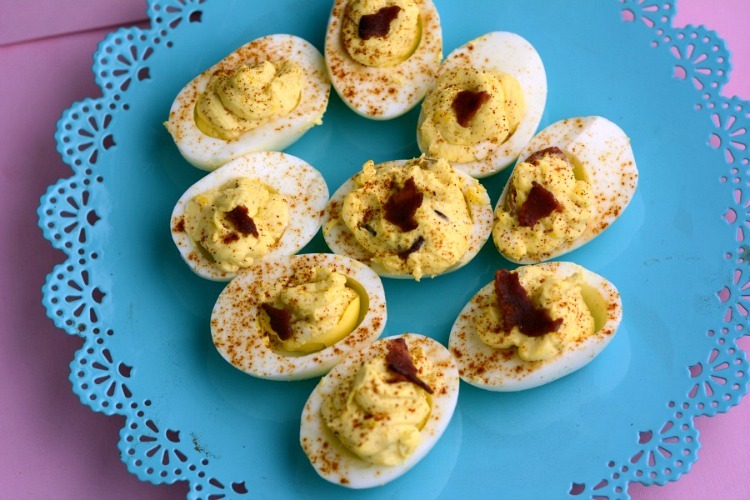 Top your deviled eggs with paprika and extra bacon. What’s your favorite spin on classic deviled eggs? Wow never thought to add cream cheese. Sounds like an interesting recipe. Thanks for linking up to Merry Monday! Sharing on Yummly! Have a great week! You had me at bacon. Bacon makes everything better. It’s nuts. Definitely going to try these at the next get together! Thanks for linking up with Delicious Dishes Recipe Party!